L to R: Darren Fudenske, Christopher Tester, Anne Tomasetti, Liarra Michelle, Onudeah Nicolarakis, Forrest Weber in Captive Audience. Photo by Clint Gorges. 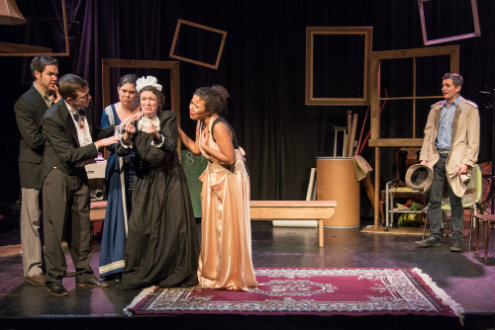 BOTTOM LINE: New York Deaf Theatre offers a smart bilingual presentation of seven short plays by David Ives that is also a lot of fun. David Ives and New York Deaf Theatre make sense as a match. His writing is very much about language and its shows incorporate two of them—spoken English and American Sign Language (ASL). But then again, ASL is communicated through movement and facial expressions. How would that work within the wordplay and pun-heavy world of Ives? Very well, actually, thanks to some smart choices from director Garrett Zuercher. As with other shows presented in both languages, hearing actors speak while Deaf actors sign, but in this case, it's not always a hearing character serving as the voice of the Deaf character. When and how each language is used depends on the nature of the story. For example, the act one closer Arabian Nights is already about miscommunication through an interpreter. In this version, Chris Ogren plays an interpreter who facilitates between Flora's (Oni Nicolarakis) ASL, and Norman's (Forrest Weber) English. In The Mystery at Twicknam Vicarage, Inspector Dexter (Weber) tries to solve a murder mystery and the maid (Liarra Michelle) functions as interpreter between him and the Deaf suspects. But there isn't always an interpreter character. Enigma Variations, about déjà vu and identity crisis, already requires the doubling of actors. It's important to acknowledge that hearing and Deaf audience members are seeing different shows and I can only speak for my experiences as a hearing person. My knowledge of ASL is limited to a few words and phrases, so I'm sure there are jokes that I missed. And some of the humor may work better for the hearing audience, but, for the most part, audience members laughed during the same scenes thanks to the comedic talents of the cast. They work well together, though a few moments seemed out of sync on the night I attended. It is truly an ensemble effort, but Anne Tomasetti is a standout. Whether playing a mayfly in Time Flies or a church lady in Lives of the Saints, she makes getting laughs look easy. Her facial expressions speak volumes. Captive Audience is written by David Ives. It is directed by Garrett Zuercher. Voice and Assistant Director is Kimberly Hale. ASL Master is Michael Sprouse. Set Design is by Lauren Mills. Lighting Design is by Fred Uebele. Costume Design is by Kristi Siedow-Thomopson. Props Master is Courtney Kupferschmidt. Dramaturg is Clint Gorges. Production Stage Manager is Miriam Rochford. Assistant Stage Manager is Melissa Jones. The cast includes Stefanie Anarumo, Darren Fudenske, Liarra Michelle, Oni Nicolarakis, Chris Ogren, Christopher Tester, Anne Tomasetti, and Forrest Weber.